Presentations include botanical therapies for asbestos-related lung cancer, hypothyroidism, healthy sexual function, hormonal imbalance (affecting both men and women), hepatitis C, glaucoma, cataracts, animal health, liver conditions, dysfunctional uterine bleeding and working with active drug users. Other presentations: medicinal uses of little-known Mexican herbs with herbalist Michael Moore; religion and botanical medicine with Bill Mitchell, ND and herbal pairing in formulation with Paul Bergner. Purchase the digital download of the lecture notes (PDF) and recordings (MP3) here on our website (see product listing on this page). 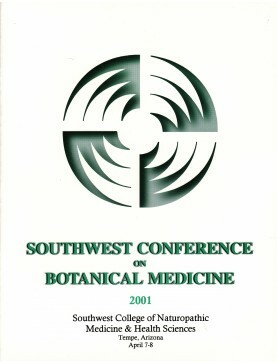 2001 Southwest Conference on Botanical Medicine: Conference Book. Order download of PDF f..
Speaker: Donna Odierna. The introduction includes the etiology, diagnosis, signs and sympt..
Speaker: Deborah Frances. Native American and modern clinical uses of the three plants for phys..